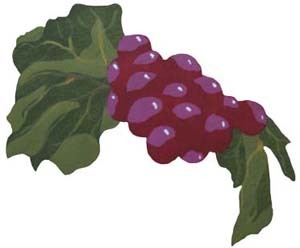 The most popular decorative painting designs include a leaf stencil – the ivy vine, a bunch of grapes with leaves, a rose… Here are a couple of tips to add details to leaves. Once you've painted the image of the leaf stencil onto the project surface, use a very thin artist brush to run some veins through the leaves. You can picture a leaf and how the veins run through it. If not go into the yard and get one. The real trick is to remember that almost anything goes. The lines don’t have to be exactly straight. Just relax and pull the brush from the base of the leaf to the tip. If the brush runs out of paint before you reach the tip, don’t worry. It's a perfect effect! Don't miss the video below to watch as a leaf stencil and grapevine create a kitchen border. After you read more about perfecting the leaf stencil go to Rose Stencil for two free stencils with leaves for practice. While painting veins, try pouring two or three different paint colors onto your palette (just a small amount of each). Wet a thin bristle brush with paint by pulling it through the different colors while rolling the handle through your fingers. Now with one stroke your brush is spreading a variety of colors onto the leaf. Try using the same rolling motion when painting the veins. You can even use this technique to show off the seasons on your leaves. For example, use a pumpkin or mustard color with a green for a fall look. Here is an example of a painting using the above tips. A small drop of mustard was added to a light green for contrast. Just a little side note: I know this article is about the leaf stencil, but I wanted to share with you a tip that I used on the grapes. I painted white spots on each grape to give them that fresh, wet look. To do this use either a dot from the tip of a small round paint brush or drag the brush a little so you have a very short line. Since the grapes are round, drag the brush in a small curve. Also, I like to use a very light gray instead of a bright white. For more practice with a leaf stencil and to create beautiful art, go to Hibiscus Stencil for a Free Stencil you can print now! In an effort to bring you a complete solution for all of your stenciling needs, we now have a catalog for you to browse a large variety of designs. So, check out our Stencils Designs for your next project. Below is a sample of the design books that we offer. 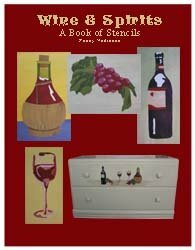 This book includes the Grapes and Leaf stencil used as an example on this page. Each book will come to you as a downloadable and printable pdf file in your e-mail. Just check your e-mail after purchase for the link to connect to your file and print or save. It's that easy! If you'd rather get your Stencil Pattern Books in Print (like these) then visit our Printer's Book Shop for a large variety of stencil collections. These books are easy to follow and come with complete instructions. You'll find all of the stencil designs used as samples throughout this site. The Grapes and Leaf Stencil featured in this example, and all other stencil designs used on this site are courtesy of Designs From Penny. Well, here's the video I promised you. Don't miss the free stencil at Grapevine Stencil. Enjoy! Return to Home Page from Tips for Adding Details to Leaves. Return to Advanced Tips from Tips for Adding Details to A Leaf Stencil.